The beautiful and sacred art of iconography in the Coptic Orthodox Church is dying before our eyes. To be honest, I don’t know what this image is supposed to mean, but it must mean something to many Copts, because these types of images are flooding the social media accounts and even homes of Orthodox faithful. Isn’t this a beautiful icon? Yes. Isn’t this a Coptic Orthodox icon? No. Modern Coptic Orthodox youth who wish to identify with their Orthodox heritage oftentimes use Byzantine and other Eastern Orthodox iconography (as I do on this very website), because Coptic iconography is becoming more and more scarce. And herein lies the problem: we are presiding over a bitter paradox. On the one hand, scholars from all over the world are engaging in costly restoration projects to preserve beautiful Coptic iconography in places like the Monastery of Abba Antony in the Red Sea and the Syrian Monastery in Wädi al-Natrûn, but on the other hand, at a grass roots level, Coptic iconography is fading away. Where are the great and various schools of Coptic iconography that are preparing my generation in the theology, technique, and preservation of this sacred art? As far I know, the Coptic Clerical College in Egypt trains a handful of artists, like the modern master, Dr. Isaac Fanous, and recent graduates, but where can the training be found outside of Egypt? We say that our Church is now a global one, but shouldn’t that mean that Coptic iconography must now be taught off the soil of Egypt in order to meet the needs of a global Orthodox Church? Moreover, where can the average Coptic Orthodox faithful obtain an authentic, theologically correct icon at a reasonable price? We have a few monasteries/convents in Egypt that mass produce Coptic icons, but it’s all but impossible to purchase them outside of Egypt. In our local parish bookstores, for example, we tend to welcome imported Western religious art, like statues and realistic paintings, from Mexico and China, which Orthodox faithful sadly purchase and allow into their homes. I have oftentimes visited homes and expressed surprise at seeing an authentic icon (or even a reproduction), because it has become so rare. Without realizing it, we are losing iconography in our beautiful Coptic Orthodox Church. For me, it is not a matter of heritage, because it seems that the various universities and societies are doing a good job of preserving our heritage for us. Rather, it is a theological issue, a spiritual issue. 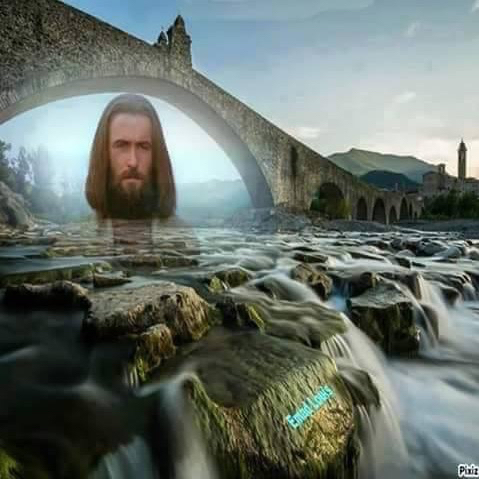 Looking at that Western image of Christ under the bridge (see above) doesn’t teach me anything. From the earliest days of Christianity, eikons were material representations of the Divine, “windows to heaven,” as is oftentimes said. When the early Christians depicted a dove, it was a reference to Christ just as the fish was. Look at the words St. Basil uses to describe the feelings that arise in beholding an icon: we are to be overwhelmed at this vivid depiction of Christ in the bravery of the holy martyr. Look again at the Western image above. Do St. Basil’s words describe what you are feeling? Did you learn anything from Christ under the bridge? I don’t mean to ask that question in a condescending way, because that artist, and perhaps some people, are moved by such Western art. Perhaps such art even has a limited place among Christians. But we should not rely on this type of art to the exclusion of sacred art, which has been handed down and refined for 2,000 years as part of our Orthodox Tradition. There are a number of things that we can do to reverse this tragedy, if we have the desire and will. First, we can ask our fathers, the hierarchs, to establish schools of iconography throughout the world. Of course, this will take time and much preparation, and I am sure our hierarchs, filled with the Holy Spirit, are already working on this. It would be wonderful to see more holy monks and nuns trained in Coptic iconography so that this art may thrive and bear fruit in the hands of those who are leading a pure and holy life. As with anything in the Church, the work of our hands is directly tied to the purity of our souls, and I think the holy ascetics are the best ones to carry out this important responsibility (assuming they have the God-given talent). Second, on a parish level, we can ensure that imported Western art is not the only option for people who want to buy sacred art for their homes from the parish bookstore. We don’t necessarily have to eliminate the imported art, but at the very least, it certainly shouldn’t be the only option. Third, and also at the parish level, we need to speak to people about the origin, meaning, and benefit of sacred iconography more. If God wills, I certainly plan to post more about the meaning of iconography as part of this site’s service. If people understand the meaning of icons, they will love and embrace them. Fourth, in our homes, we can strive to make icon corners with authentic icons so that our children may interact with them every day and understand that this is the norm for an Orthodox household. We read, in the Life of St. John Chrysostomos, that, as he studied the Epistles of the Holy Apostle Paul, he continuously looked at an icon of the Holy Apostle, which seemed to come to life and speak to him. Are we ready to do the same? 24 Responses to "The Slow Death of Iconography in the Coptic Orthodox Church"
Fr Alexander Aziz, must read!!!! Dear Fr Moses, I can assure you that Coptic iconography is very alive and flourishing at St Athanasius Coptic Orthodox Theological College in Melbourne. Our talented Coptic iconographer Ashraf Fayek teaches regularly and has his own studio on site. He is running a course this semester as we speak. Not only this but he reproduces these beautiful icons on canvas and mounted on wood in a very wonderful way. Thank you, Sayedna, I am aware of the wonderful program in Melbourne. As I mentioned in the post, I am sure that Your Grace and the other hierarchs of the Church are working towards establishing programs such as these. I hope Coptic faithful will embrace them. I have a lot to say about this but will refrain but I will say I agree fully with abouna’s blog post with the above noted exceptions. Stephane Rene – your thoughts? My thoughts are too many to discuss on this FB forum. Needless to say I totally agree with Abouna Moses’ observations. He is one of very few people who has realised that there is a problem with Coptic iconography today. Monica Rene has addressed this very subject in Coptic Civilization (Editor Gawdat Gabra, AUC 2014) in her chapter on contemporary Coptic iconography. But the problem is in reality unfortunately bigger and deeper than Abouna describes. Shools are a great idea, but where do you get the teachers? Where do they train and who trains them? I have been talking about this for many years, but obviously to deaf ears… Who knows the Coptic iconographic tradition, the canon left by I.Fanous, the symbolic vocabulary? Everyone is mostly interested in “developing their own style”. The problem is they can’t and should not even be interested in that. It’s a problem of attitude more than anything else. Iconography is not about ego and individualism. It’s about humility and prayer. As Abouna very rightly writes, Coptic iconography died on FaceBook. The power of icons is amazing with young toddlers. I started teaching my daughter of 18 months the story written on various icons in our home and in our prayer corner. It’s something that would be tough for her to understand if I explained the stories to her verbally without the assistance of icons. Now she must kiss all the icons in the church during services because she has built a relationship with all icons she sees. The amazing part is she can tell the difference between an icon and a normal picture at such a young age. I’m looking forward to your future posts about iconography. May God bless your service. This thread has gone all quiet… Was it something I said? Coptic Orthodox Icon art is not alive in most Coptic Orthodox churches & monasteries in Egypt…. Most of our Coptic Orthodox Bishops & priests prefer the western Italian panting….. So sad too that the Coptic Catholic Churches use the Coptic Icons as well in their Churches & monasteries right now by the blessed of Pope of Rome…. No Comment!! Can H.G Bishop Suriel tell H.H Pope of Alexandria Tawdros II to make the Coptic Orthodox Icons as order to all our Coptic Orthodox churches and stop them to use the Italian western style any more….?!!! To be honest I feel very jealous when I visit any Greek Orthodox Church…. it’s make me feel like I’m in the heaven in the earth coz of their amazing icons…. when I pray in Coptic Orthodox church have the western Italian panting in the walls I feel like I’m praying in Latin Roman Catholic church….. so sad…. more than 3000 Coptic Orthodox Icons photos and more.. ? For those interested in commissioning authentic Coptic icons for their churches or homes, here is the website of Dr. Stéphane René, one of the senior disciples of Dr. Isaac Fanous, who founded the Neo-Coptic School of iconography: http://www.copticiconography.org/. We need St. john of Damascus to defend “the Coptic iconoclasm” that we are witnessing nowadays. Good article Abouna please continue. I’m glad to hear that someone in the Coptic Church is expressing this concern. I am a church designer and liturgical artist in the Orthodox Church (OCA) and I work closely with talented iconographers all over the world. I also founded the Orthodox Arts Journal. So I have some expertise in this area of contemporary iconography. I would like to point out that the Orthodox Church also almost completely lost her iconography over the course of the 18th and 19th centuries, and all that was left by 1880 was Italian-style painting and unskilled copying of old icons. But after that there was an international movement to revive medieval iconography in both the Greek and Russian traditions, and this movement continues to this day. Now we have hundreds of good iconographers in the Orthodox Church, and dozens of truly great ones. 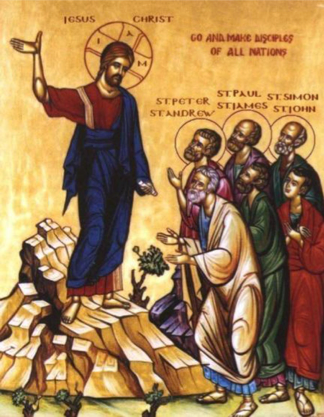 Nevertheless, even in the Orthodox Church, good original iconography is still more the exception than the rule. More common are printed reproduction icons and those artistically inept so-called ‘Neo Byzantine’ icons that are dead and opaque and really look nothing like medieval art. But progress is being made, and every year there are more really good iconographers doing important commissions. But I would point out that it has taken us over a hundred years to get as far as we have, so reviving Coptic iconography may be an equally long road. Fr. Moses is correct that the best thing going on in Coptic Iconography right now is that there are conservators and curators all over the world restoring and publicizing the great heritage of medieval Coptic painting. This is a most important start. It was exactly this process in 19th-century Russia that sparked the revival of iconography, because for once talented artists saw the beauty of medieval Russian icons, and decided to devote their careers to painting in that style. And this is how it must happen in the Coptic world. Talented art students must decide that Coptic iconography is a genre worthy of their attention. Only then, will we see great new Coptic icons. So far, I am not aware of anyone doing this. There are several ‘Neo-Coptic iconographers’ (some of whom are referenced in the comments here), but I feel I must say that their style of painting does not resemble medieval Coptic work in any way whatsoever. It is somewhat reminiscent of 1960s stained-glass windows, and sometimes of Celtic manuscript illuminations, but it simply doesn’t look anything like the frescoes and manuscripts from ancient Egyptian churches. I have no idea why they call such painting ‘Neo-Coptic style’. If I may offer a suggestion to priests wanting to make a dent in this problem, I would say the following: Stock you parish bookstores with art books about medieval Egyptian/Ethiopian/Syrian art. Hang up posters in the parish hall that show frescoes from the ancient monasteries. Bring in art historians to give lectures on the restoration projects at these monuments. In general, educate your people so they actually know what Coptic iconography once looked like, long ago when it was a great and living liturgical art. That way, one talented person among them may someday be inspired to actually paint in this style, and the rest of them will be able to recognize it for what it is. Thank you, Andrew, for your valuable contribution and suggestions. We certainly need more studies of past and present Coptic art leading to a revival similar to what you described among our Eastern Orthodox brethren. A local priest raised a good point, I think: Did the Coptic Orthodox Church ever have a strong iconographical tradition? Perhaps we need to answer that question to know exactly what needs to be revived. I believe it is so important that our children, and all of us in the Coptic church understand the Icons. I am so thankful for how it has inspired me. Could you please help direct me to whom I could work with in starting a book for children in the church.